I remember when I first came across a set of soccer mannequins. I was at the academy facilities of a top 4 premier league club on a pre-season training day. We had huge setup where all the coaches were split into groups and asked to take part in 10 mini-sessions over the course of a few hours. The goal was that we would be coached by more senior coaches, learn from their experience, use their training drills as inspiration and essentially leave that day more motivated and knowledgeable than when we had arrived. In short – it worked. We were exposed to all sorts of different training techniques and drills that we could take away and start using in our own sessions. One of these mini sessions used a piece of equipment that I had seen used before but never really had taken any interest in learning more about. I mean I came from a training philosophy that soccer skills could be developed and refined with minimal equipment – and while I was partly right, what I didn’t realize at the time was that exact mindset was hindering not only my own development as a coach but the development of the players I coached as well. I’ve since come to learn that using the right equipment, with the right players can not only help them develop as players but it also helps create an environment that’s engaging, fun and realistic. Anyway, what was this piece of equipment I had ignored for so long? While they’re not the answer to all of your team’s problems – soccer mannequins are brilliant pieces of equipment that when used in right drills can have a great positive affect on your team’s development. Soccer mannequins are great pieces of equipment that can simulate defenders well. While they can’t completely substitute a real defender they can add a bit more realism to training. They also help improve a players positional awareness. Most mannequins come in two pieces – the body of the mannequin and the base to keep it in place. They’re portable meaning you can carry them to and from your storage ‘unit’ with relative ease. 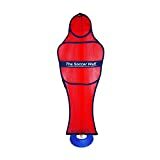 Leading on from portability – soccer mannequins are super easy to store. The bodies of the mannequins can easily slide in-between things (say, a shelving unit) and take up very little floor space. While the bases do take up more space on the ground, they’re pretty easy to stack on top of one another. Soccer Mannequins are brilliant to practice dead ball situations. Free Kicks: One obvious way of using your mannequins is to set them up in front of the 18 yard box for free kicks. They can act as dummy defenders and encourage players to start aiming for hard to reach areas in the goal. Corners: A less obvious example would be using them as targets and defenders for corner practice. A problem some players come across especially when taking corners is getting the ball past the first defender. So for example, you could set one mannequin up as a defender close to either side of the 18 yard box – then use another mannequin as a target attacker. As I briefly mentioned above, most mannequins come in two pieces – the body and a weighted rubber base. The rubber bases work really well outside but in some cases, coaches opt to not have a rubber base at all and simply just use the spikes on the body to secure it into the grass. Of course this isn’t going to work indoors where the ground is usually wooden flooring of some type. This is where the rubber bases really show their merit as the weight and rubber material ‘stick’ to indoor surfaces really well. Overall most mannequins with both the body and base can be used indoors, outdoors and on turf. Below I have listed the 3 best soccer mannequins currently on the market, their differences and additional tips I think will help. Overall you could go with any of the 3 below and achieve all the above benefits. We’ll start with these mannequins from UBER Soccer. This is only one where you’ve got 3 different size options; small, medium and large. 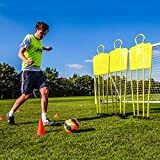 Small comes in at 4ft, Medium at 5ft and large at 6ft – this is especially useful if you train younger players and want to simulate the opposition as closely as possible. There’s only one color option though – Red. And, the rubber bases are sold separately. These soccer mannequins from FORZA Soccer come in 2 sizes: Junior (5ft 4in) and Senior (6ft). The price difference from these mannequins in comparison to the UBER ones above is very minimal however as you’ll notice, you do get a slightly better option with the FORZA mannequins as they provide a 3 pack options saving you a little bit of money. The FORZA mannequins come in yellow. Again, it’s worth noting you’ll need to purchase the rubber bases separately. These soccer mannequins from Soccer Innovations are slightly different. While the other 2 are pretty sturdy pieces of equipment these ones have more ‘give’ in them. Unlike the other 2 options – they don’t require you to purchase the bases separately. They come with a spring base and an additional sandbag to keep the mannequins in place. 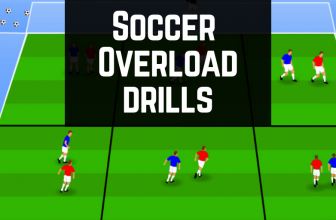 If you’re really considering investing in a soccer mannequin here’s some drills to spark you inner creative genius…. 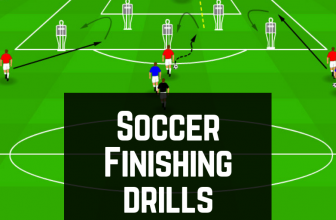 This is a simple little drill that not only has everyone working at the same time but can be progressed to incorporate various different skills and techniques. 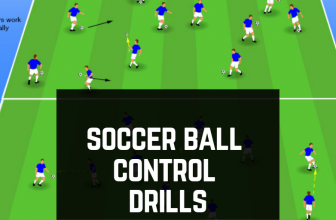 This is a more complicated drill that would be better suited for older players. 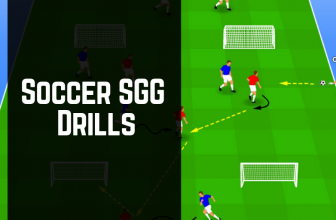 It develops positional awareness and encourages players to look for gaps to play the ball forward. 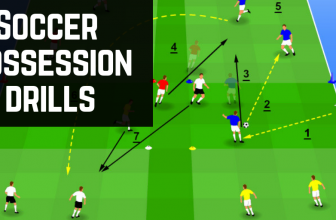 Again this drill can progress further by limiting the amount of touches a player has on the ball and developing the types of runs the attacker makes. Here’s a really good, in-depth video from the UBER Soccer Education Series. 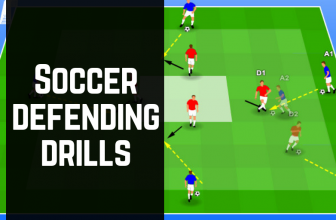 It showcases various different drills that helps improves; decision making, close ball control, short passing, movement and accuracy amongst a whole host of other things. Training is all about preparing yourself for match days. You prepare both physically and mentally, developing and refining your skills until you improve. You then take these refined skills, hopefully relay the learning process you’ve gone through on the training pitching and then apply them to a competitive environment. One of those training tools that that can help solve both of those problems is a set of soccer mannequins. Soccer Mannequins aren’t a new concept. They’ve been round for years but unfortunately youth soccer clubs don’t tend to use them all that often. So break the mold my fellow coach, invest in a soccer mannequin or two and get creative with your drills and training sessions – your teams development will love you for it.